Home » Products » General » Bronze Orientalist Cold Painted Figure – Franz Bergman, Austria. Arab on Carpet, circa 1900. 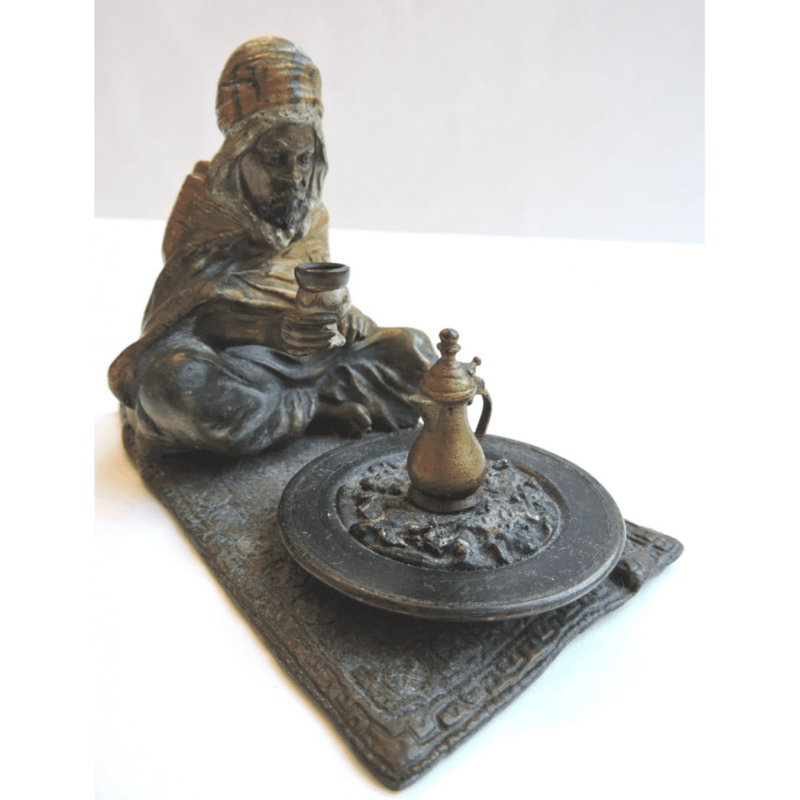 A small bronze cold painted figure of a Arabian man on a carpet with a cup of coffee in his hands and a coffee pot on a bed of coals. The figure is by Franz Xavier Bergman who’s specialty was in bronze figures in the Orientalist designs usually of Arabians on carpets. Signed with the Bergman two handle urn mark on bottom. Product ID: 65794 Category: General. Pair Stunning Bronze / Gilt Bronze & Rouge Marble Candelabras – 28 inches high. A stunning pair of French patina’d and Gilt bronze 6 light candelabras. The base in a heavy rouge marble. The body of the candelabras in a classical style with classical figures all around. The pair is quite large and very heavy – measuring 28 inches high. The quality is exquisite. Large Paris Gilt Bronze Figural Clock Set with Red Marble Base – by ‘Mathurin Moreau’ & Aug. Lemaire – circa 1850. A spectacular and extremely heavy 3 piece garniture Clock set – with gilt bronze figure of a woman standing on top of heavy red marble bases and matching gilt bronze & marble candelabras. Gilt bronze statue signed Mathurin Moreau (1822-1912). Clock face signed ‘Mson Aug. Lemaire. E Lohse Sucr. 121 R. Vieille du Temple, PARIS’. Clock measures: 25.5 inches high. Each candelabrum measures 24 inches high. Louis XVI French Marble and Bronze Doré – 3 Piece Garniture Clock Set – Gille L’Aine, Paris.